Besides pregnancy irregularities and preparations for labor, it is always essential to check the gestational age. The accurate counts can determine the right anticipation for further stages. Besides, the gestational age is part of a healthy pregnancy. In addition, it is necessary that moms know the right age of pregnancy will reduce anxiety in pregnancy. Once the right gestational age is determined, the size and weight of the babies can be measured as well. There are some methods for determining the age of a fetus. The accurate gestational age can lead to good labor. Besides, moms also need to be sure that they get informed of the estimated due date of labor/expected date of delivery, also known as the Estimated Date of Confinement (EDC). There are also some methods of determining the delivery date estimation. One of the methods is Naegele’s rule. Naegele’s rules are the method of determination of the estimated delivery date by adding 7 days to the first day of the last normal 1 menstrual period. The method counts back 3 months and adds 1 year. That explanation is taken from Farlex Partner Medical Dictionary © Farlex 2012. 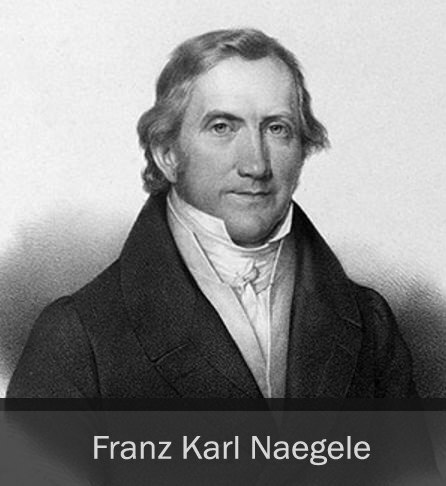 According to Wikipedia, Naegele’s rule is named after Franz Karl Naegele (7 December 1778 – 21 January 1851), the German obstetrician who devised the rule. How to Calculate Your Due Date with the Naegele’s rule? 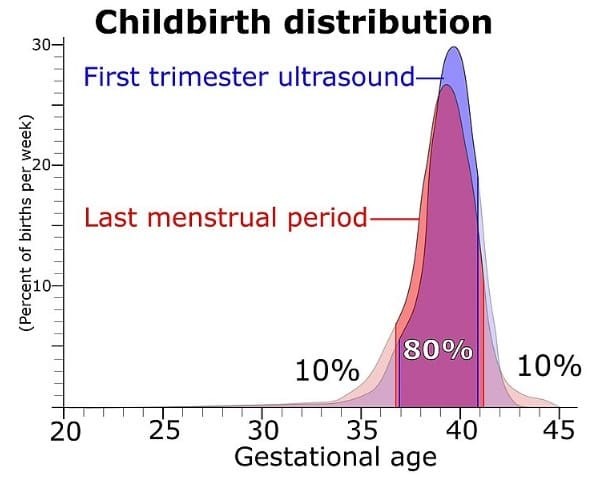 The basic rule of Naegele’s Rule is that it predicts the due date estimation based on the mom’s last menstrual period (LMP). The method only estimates the due date based on that number. Therefore, the small changes in the leap years or any others are not taken into consideration. Besides, months that have lesser than 31 days are not taken into a detailed count as well. We can now use an online service for counting the due date based on the method for free. We can count the date automatically and save it at the same time. The users’ account and health information are protected. Users should enter the digits for LMP, 2 digits for month and date and four digits for the year. Though this method can give a relatively accurate result, it is not an official way to estimate gestational age. The alternative estimated due date (EDD) calculation methods and an official tool is the pregnancy wheel and ovulation calendar. The tool counts the gestational age estimation from the due date confirmed by the ultrasound. Normally, a pregnancy lasts for 40 weeks. The average pregnancy is 280 days. The first day of the last normal menstrual period is counted as day 1. Determine the first day of the last period. After that, count three calendar months from that day. The last step is to add 7 days to the day. Our last menstrual period is on September 9th, 2010. We have to count 3 calendar months. The result will be on June 9th, 2010. After that, we need to add 1 year. The result will be on June 9th, 2011. Next, we need to add 7 days. The estimated due date will be on June 16th, 2011. It is helpful to also check out this video. EDD actually stands for Estimated Date of Delivery. Here are two other methods for counting the estimated due date of labor. First of all, moms should determine the first day of the last menstrual period. It is similar to the previous method. After that, we need to add 1 year and then subtract it by 2 months and 14 days. If we have a varied cycle, we have to add the difference to the actual cycle duration. Besides, we need to also add 28 days. That will result in the due date. This is called primips. After that, we still need to do the multips. We need to add 1 year and subtract it with 2 months. Next, we have to add 18 days. Now we have to do the similar steps to the varied cycle. That will result in the estimated due date. This method is widely used in many countries. It is an actual method that is utilized by the professional midwife as well. First of all, we have to determine the first symptoms of pregnancy. We can use our date of conception or ovulation. After that, we need to determine the full moon before. Next, we need to count to the 10th full moon. If moms only know the last menstrual period, full moon after LMP can be used. The accurate gestational age and due date estimation methods such as Naegele’s Rule will help doctors and moms to predict the due date. It is sometimes impossible to give birth to an accurate date. However, when the due date estimation is determined, moms will be able to get ready with the possible contractions around the date. Besides, other labor preparations can be managed well with the accurate Estimated Delivery Date. Is it Safe to Eat Imitation Crab Meat while Pregnant?